People wave Cuban and American flags and sing along with music at a rally on Calle Ocho celebrating the death of Fidel Castro. Vivian Betancourt and her family say the jubilation Cuban exiles feel over Castro's death has been misunderstood. Maria Prada dances in a line of people on the streets of Little Havana during a rally celebrating life after Fidel Castro on Nov. 30, 2016. 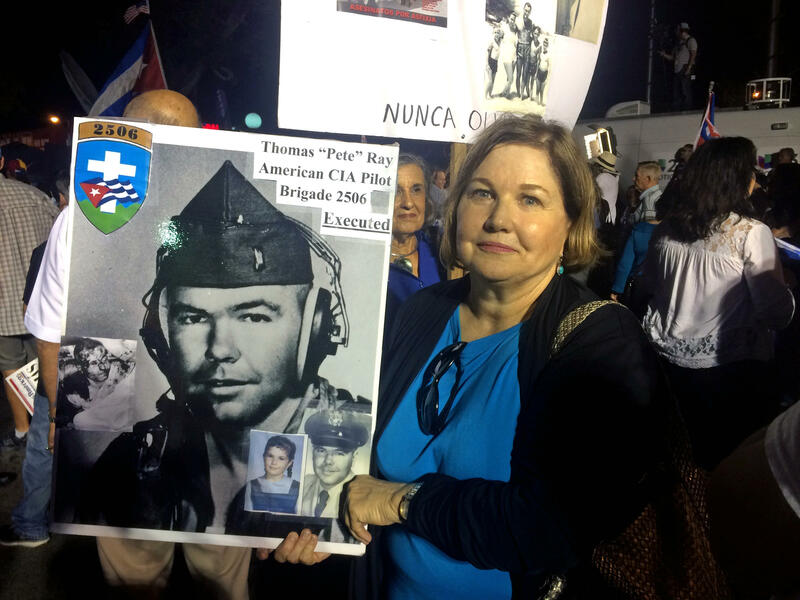 Janet Ray holds a photo of her father, a CIA Pilot shot down during the Bay of Pigs invasion. Jose Novo left Cuba when he was 13 years old in 1966. Although elated that Castro is gone, he doesn't think anything is going to change on the island anytime soon. Several signs and t-shirts read "No Castro, Yes Trump." Janet Ray says her father was a secret casualty of the Bay of Pigs invasion, as a CIA pilot shot down and executed when he survived the crash. "Castro kept him in a morgue for over 18 years," she says. Ray was six years old when her father died. The official story was that he had drowned while flying a cargo plane. It would be decades before she found out what really happened. "I came from Alabama when I was in college, and would walk up and down the streets of Calle Ocho, looking for my father, trying to find out the truth," she says. She went out Wednesday to have that weight lifted. "And this is the first night that I have really come out, because I just couldn’t get the elephant off my chest." Like many others there whose relatives died fighting the Castro regime, Ray carried a sign showing her father’s photo. People waved Cuban and American flags alongside portraits of loved ones assassinated under the Castro Regime. Some danced in circles holding each other's hands on the police-barricaded street, lights illuminating their faces as they sang in elation. For Vivian Betancourt, the jubilation has been misunderstood. "We're not celebrating his death because we're bad people," she says. She carried a sign that explains: If you haven't live our pain, you cannot judge our happiness. After 37 years in the U.S., Betancourt says she's still waiting for the day the Cuban government will allow her to return home.